July 20, 2017, 9:04 PM · One of my biggest struggles as a teacher is creating opportunities for my students that will not only reinforce the extensive training and investment required to excel in music, but will additionally be landmarks in the country of their growth. In a relentlessly competitive field, it is hard to create environments and space that encourage children to hone their skills while respecting and embracing their colleagues. It is a ceaseless challenge to reinforce the exponential discipline involved in music, while nurturing the eagerness that feeds most of our musical urges. 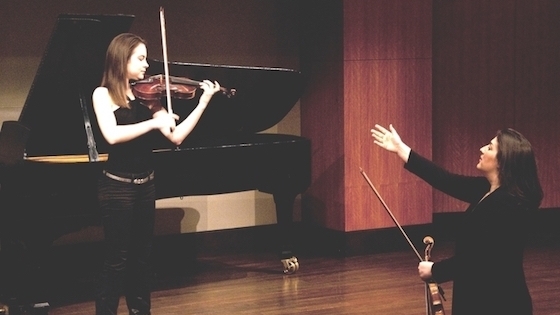 Elizabeth Faidley, a violin teacher at the Manhattan School of Music, is a master at filling her studio with opportunities that meet these demands, all the time. 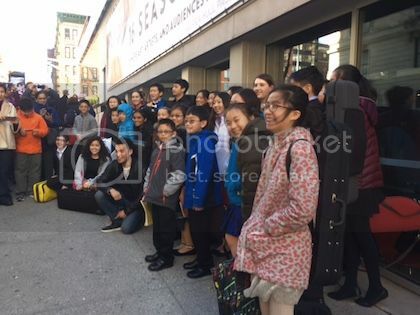 Over the last year, she has hosted master classes with renown soloists Sarah Chang<?a>, Peter Winograd, Yevgeny Kutik, Vadim Gluzman, and Ray Chen, as well as orchestrated an immense collaboration with Washington Heights Chamber Orchestra, a local professional orchestra, that culminated in a concert featuring 42 of her students in solo performances with the ensemble. Elizabeth Faidley instructs a student. Faidley's students are very fortunate to have as many opportunities to attend and play in master classes as they do, let alone with such inspiring and accomplished artists. On top of this fortune, she gives her students the additional boon of specific functions with each class. Kutik's class focused on the Bruch Violin Concerto. The event featured Kutik's performance of the concerto, followed by a master class that focused solely on excerpts from that concerto. Winograd's class focused on Faidley's seniors, and was structured to prepare them for conservatory auditions a few months later. Gluzman's master class was part of a much larger project. Faidley collaborated with The Orpheus Chamber Orchestra to bring her students to a much fuller appreciation for the music that they learn. Faidley had her studio write an essay on Tchaikovsky, which required researching the piece and composer, and comparing three different recordings. Then she assigned each of them an excerpt of the concerto, based on their technique level. Gluzman gave his master class. 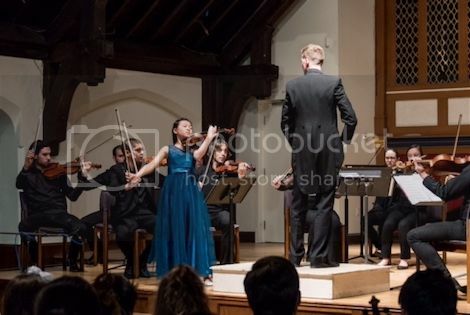 Two days later, Faidley's studio attended his performance with The Orpheus Chamber Orchestra. 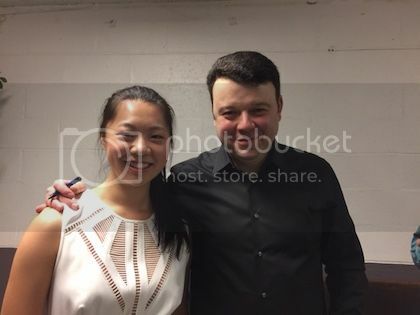 She brought over 110 people to his performance of the Tchaikovsky Violin Concerto. Faidley and the OCO are in the works for another collaboration with Lisa Batiashvilli's performance of Prokofiev's Violin Concerto No. 2 in March of 2018. Faidley's deliberation and brilliance with her organization are not limited to large projects like her programs framed around the inimitable OCO. Faidley applies her drive and organizational skills to her unique structuring of the master classes she schedules for her studio, as well. Master classes typically allow for three or four students to play part of their prepared piece. The guest artist will then work with the student in front of the audience, ideally including the rest of the studio, plus anyone else that is interested in learning from someone else’s experiences. Faidley arranged hers to include around twenty students in each class. That some students are excluded from master classes because of competition and time constraints is a reality that frustrated Faidley, so she restructured the master classes to be inclusive without losing purpose. For Gluzman’s class, she assigned groups of six to eight kids specific lines of the same concerto. They performed the lines together, and Gluzman then addressed them as a group. He could address individual students, or the group as a whole, but because they all performed together, they responded to everything Gluzman said as a group rather than as individuals. The students were less distracted by their own mistakes because the group setting changed the focal point of the sound. This, combined with Gluzman’s direct and thorough attention to detail, allowed for exponential improvements in phrasing and sound control, all accomplished within a fraction of the amount of time it would have taken in a one-on-one setting. The group format allowed the students to help each other do what Gluzman asked; they had to move together and understand the new concept the same way in order for it to be convincing when they played. Needing to understand the concepts quickly because their classmates were relying on them factors heavily in professional musicians’ careers, and as such, is a necessary component to performing. Faidley utilized ensemble learning tendencies as a motivational tool during this master class, and it worked beautifully. Chen’s master class set-up was traditional with a twist. Faidley again had several groups stand on stage at once, but this time, each student played a few lines of their solo concerto by themselves. Their individual performances did not exceed one minute, and Chen spent at most ten minutes with each student. The excerpts from each concerto were carefully picked so the work being done on it would be applicable to more than just the three lines performed. Chen was brilliant and flexible, picking universal techniques that addressed overall character of a theme or piece. He sought to give each student a permanent takeaway. The format in this master class gave the students drastically different opportunities for growth than the Gluzman class. Jumping into a concerto mid-movement and only playing a fraction of it while incredibly nervous is very similar to the way orchestra auditions work. These kids were required to jump into a specific type of sound for a distinct phrase without recent warm-up time, as well as find a way to finish their excerpt without losing the last few bits of music to the abrupt ending. They made mistakes they weren’t accustomed to making, but needed to stay centered in order to respond to Chen’s input. 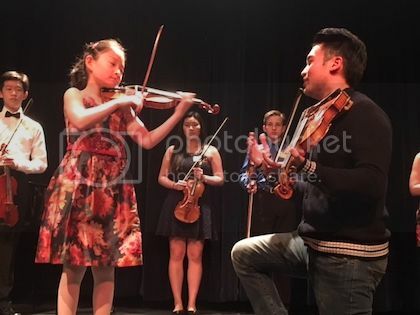 The class was not only an inclusive opportunity for individual instruction from a profound musician; it was also prep work for professional orchestra auditions later on in life. Two months later, Faidley arranged to have 42 of her students solo with the Washington Heights Chamber Orchestra of New York City. They performed a selection of baroque music, including the Vivaldi Four Seasons and various Telemann works. The gala concert was a massive undertaking, involving months of planning and coordinating. Faidley, driven and dedicated under even the most casual circumstances, was intent on giving her students the unique experience of performing with a live orchestra. She spoke to me of the different understandings we have with an orchestra behind us; how the melodies’ qualities change with the textures and nuances in the instruments supporting the harmonies beneath, and what we, as soloists, must do to incorporate that new understanding into our sound and phrasing. The concert was a phenomenal success. The students had distinctions between solo and orchestra voice emphasized and reinforced via Faidley’s repertoire selection. They were of course well prepared. But more than that, they were ready to receive everything that opportunity could give them, a near magical growth that wouldn’t have taken root without Faidley’s insight and expertise. I count myself lucky to have been invited into Faidley’s world; to see her studio and the vast investment she has in each and every one of her students. The doors she opens for them aren’t freestanding occurrences built on connections and luck. They are openings in hallways of trust and effort, their stability backed with flexibility and creativity welded into the hinges. Some of our teachers automatically stand out because they have reached us in ways above and beyond the routine intimacy achieved in any healthy learning environment. In Faidley’s case, it’s easy to see why she is exactly that teacher to so many.